This work involves a reinterpretation of Biblical events; especially the moment we know as The Last Supper. Throughout the Renaissance period Da Vinci and many other artists created works on the Last Supper that reflected on the Tree of Life. These works posit the woman John at the center of their work. Artists in these Last Supper works used the symbolic language of the Tree of Life. The use of the Tree expresses an alternative spiritual interpretation of this Biblical event. I hope to educate my reader enough to see the connections… without diving into a full education in Hermetic philosophy and Cabalism. Yet, the more one knows about the language of this philosophy, the easier it is to form the connections between the story of Sleeping Beauty and the Prophet John… through the language of the Tree of life. Mary Magdalene, in Hermeticism, represents the entire Tree of Life. John represents the sexual aspect of the Tree. The Magdalene’s signature letter M forms a simple template of the Tree, with its two pillars and the female chevron between them. The corner of the chevron, known as the cornerstone, resides at the center of the Tree. The name of this center is Beauty. There is a significant difference between the shape of the original love story of spiritual unity practiced in pre-patriarchal Jerusalem, as compared with the standard Christian narrative… which borrowed heavily from the original. Yet, the agenda of the standard narrative shifted emphasis from love and knowledge… to fear and obedience. 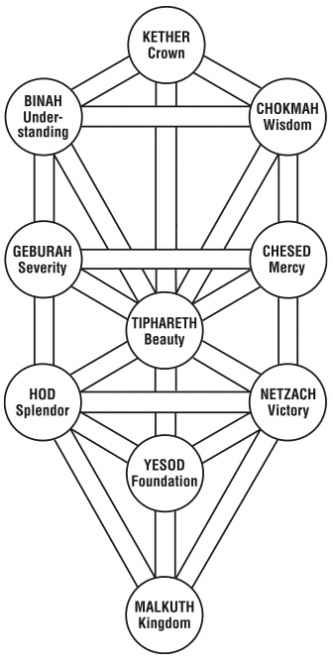 Compare the following: The first voice is that of Beauty, whose number on the Tree of life is six. The second voice is the familiarly fearsome Yahweh. that it is mighty: that ye might fear the LORD your God for ever. Our culture has been educated by the standard narrative, and captivated by the booming voice of Yahweh, for a very long time. Meanwhile a quieter voice has been telling the bedtime tale of Sleeping Beauty… a tale which represents the story of John. John (known at the time as Yon, Yona, Yonas or Yoni) is also Beauty, who sleeps only because we do not see Her for who She is. She speaks, as herself, throughout the book of John. Redactors, however, playing off the original yonic imagery of that female triangle of hair, disguised John in a coat of camel hair, and changed all the pronouns to he, him, and his. The voice of John then became HIS voice. In another short step, Johns words became the words of Jesus. Her teachings on love became the familiar teachings of Jesus. This final patriarchal stroke rewrote history, as exclusively his story… a story which eliminated the feminine as a spiritual power and a political force, and concentrated these in the male only. Thus pricked, She sleeps. And we, in the castle of culture, sleep with her. To reveal Her significant presence in the Bible, some basic instruction in the language of the Tree of Life is needed. For She represents (and is represented by) the Tree of Life. The V shape that hangs between the two pillars represents the Holy Grail as yonic cup. This sacred cup and holy vessel of the spirit is represented by the female chevron that joins the two pillars. (note the female chevron, formed by the bodies of Jesus and John, at the center of da Vinci’s Last Supper.) On the Tree of Life, the point at the bottom of this chevron, known as the cornerstone, is the place where beauty joins all the paths on the tree to the Central Pillar. The English name of the cornerstone is Beauty. Its number is six. The Tree of Life provides the Code to read the puzzle of DaVinci’s and many other Last Supper paintings.